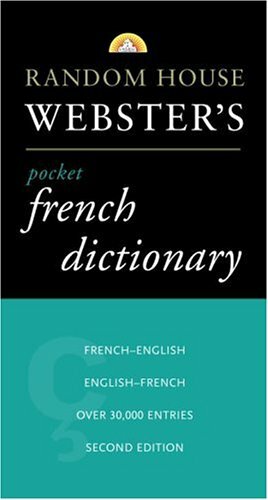 Random House Webster's Pocket French Dictionary features over 30,000 entries and both French-English and English-French translations in a great pocketsize format. Established in July 2013 in a merger between Penguin and Random House, Penguin Random House, with nearly 250 independent imprints and brands on five continents, more than 15,000 new titles published each year, and close to 800 million print, audio, and eBooks sold annually, is the world’s leading trade book publisher. Like its predecessor companies, Penguin Random House is committed to publishing adult and children’s fiction and nonfiction print editions and is a pioneer in digital publishing. Its publishing lists include more than 60 Nobel Prize laureates and hundreds of the world’s most widely read authors.